8.30am Men’s Breakfast at The Furrells, High Street, Hopton. A relaxed, and filling, way to start your Saturday. All men welcome. BAPTISM PREPARATION GROUP. This Benefice wide group are meeting on Monday 16th November 2015 at 7.30 pm at Springers, The Street, Coney Weston to review how baptisms are managed across the Benefice. If anyone would like to join the group, or would like to know what we do, then please call Yvonne Garman on 01359 221600. We would love to have in particular new members to represent Thelnetham, Hinderclay and Hepworth. We are happy to accompany your child to an All Age service if you are unable to do so. On the 4th Sunday we have a service of the word which is themed to reflect the Sunday on which the service takes place. If you would like to know more please speak to Dorothy Lodge, Hazel Maynard, Keith Lewis and myself. I do hope that you will come and join us and help us to share Gods word within our communities. Gods Blessing on you and all those you love! I have been considering the development of teams or individuals who can for example assist in taking Communion to those who are ill at home or in a sheltered housing or residential home, or follow up visiting to those who are bereaved. Other areas include visiting and advising people on baptism, visiting those who are alone and generally being available when people are in need. I would like to say thank you to those who have come forward ad are already working within our communities. In April I asked for some volunteers to take the role of Safeguarding Officer for our churches. I am pleased to state that 4 people came forward and they are: Karen Grieveson for Hopton, Dorothy Lodge for Barningham and Market Weston, Chris Flood for Coney Weston, Jan Jaraman for Stanton. 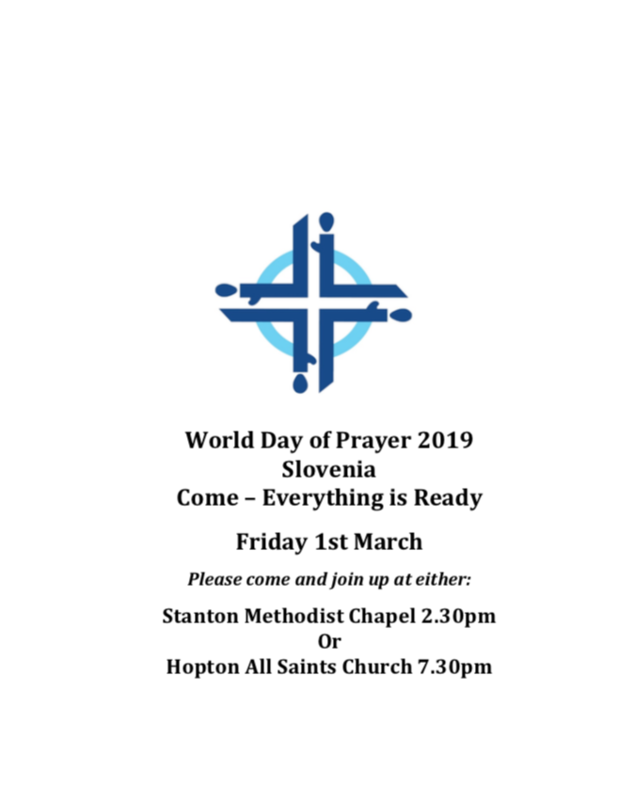 Always check your Parish News or The Stanton Steamer for times and further events.